Don’t mess with Texas’ gold. Texas Governor Greg Abbott has signed a bill into law to establish a Texas gold bullion depository and repatriate $1 billion of the state’s gold reserves held at the Federal Reserve Bank of New York, AP reported Friday. The law will make Texas the first state in the U.S. to have its own bullion depository. The depository will be open to state agencies, citizens, businesses, nonprofits, and banks for holding gold or other precious metals. 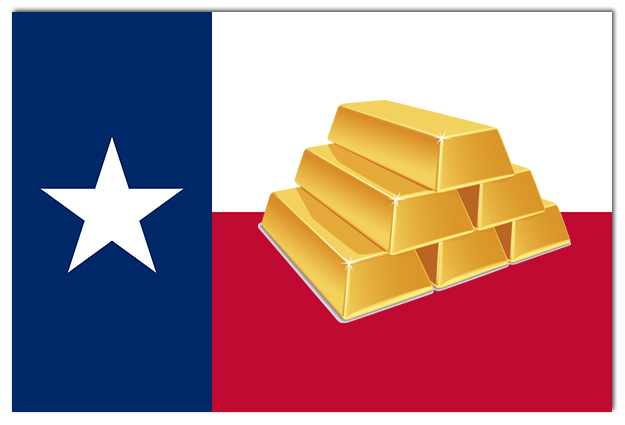 “With the passage of this bill, the Texas Bullion Depository will become the first state level facility of this kind in the nation, increasing the security and stability of our gold reserves, and keeping taxpayer funds from leaving Texas to pay for fees to store gold in facilities outside our state,” Abbott said. Texas State Representative Giovanni Capriglione first proposed the idea of Texas having a state bullion depository in 2013, but it did not pick up steam until recently. “We are not talking Fort Knox. But when I first announced this, I got so many emails and phone calls from people literally all over the world who said they want to store their gold … in a Texas depository. People have this image of Texas as big and powerful … so for a lot of people, this is exactly where they would want to go with their gold,” he told the Star-Telegram in May. “For us to have our own gold, a lot of the runs on the bank and those types of things, they happen because people are worried that there’s nothing there to back it up. So I think this cures a problem before it can happen,” Capriglione told the Texas Tribune in March 2013. Then-Governor Rick Perry supported the idea at the time. “If we own it, I will suggest to you that that’s not someone else’s determination whether we can take possession of it back or not,” Perry said in a radio interview in 2013. Texas going through the trouble of building its own state depository and transferring its gold from New York back to its home soil reveals just how precious this metal is. If the second largest state in the country wants its gold in its own hands, why shouldn’t you own some as well? Call American Bullion today at 1-800-326-9598 to speak with a precious metals broker about purchasing physical gold.